When I was a child I loved taking tests, at least until the time came when I was asked to show my work and to reveal how I came to the answers. Many times I could not explain or show my calculations. It was as if the answers just came to me from a language-free place in my heart-mind. This abstract way of thinking and learning proved frustrating to some of my teachers and forced me to change the natural manner in which I receive and exchange information. I quickly learned how to fit into the 20th century educational model of a good student by repressing, and worse, distrusting my innate intelligence. Over the years, I have recovered some of these discarded pieces and have lucid moments in which I simply "know" but cannot express why or how. Perhaps it is more accurate to say I "feel" the answer. Thus it was with mixed 'feelings' that I read the latest news on climate change. Research scientists from CERN's CLOUD project have finally discovered out the cause of global warming: the Sun and cosmic rays (click here). 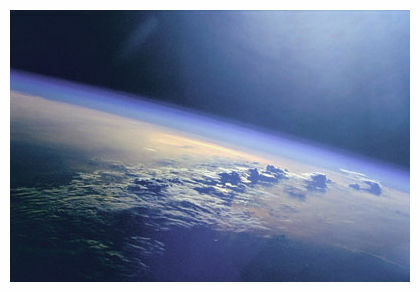 Yes, now according to one of the most celebrated science clubs, climate change may in part be orchestrated by the Sun and the cosmic rays of many of its star siblings. While I may be exaggerating the results (for a more objective response click here ), this connection is one that my intuition had also suspected without spending 9 million dollars. So why is something tugging at that space in my heart suggesting "buyer beware" of this story instead of jumping for joy that my intuition was right. Could it be just a case of bloggers like myself taking a shred of evidence and making a eye-catching headline, or political agendas swaying opinion by misrepresenting the significance of the results? Or could my own distrust and disbelief be due to the fact that the story was released under Mercury retrograde? As most astrologers will tell you, Mercury retrograde is not the time to make agreements or start new projects because when the planet of communication is in retrograde motion, we might not be getting all the facts. Sometimes there may be missing or withheld information that is uncovered at a later time when the planet is direct. Mercury is the god of communication and his archetypes include the winged messenger, trickster and teacher. 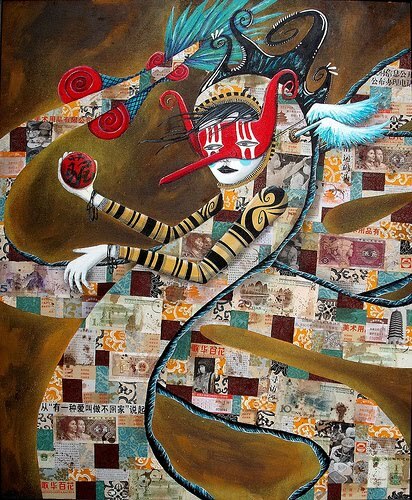 During a retrograde, the Trickster is more active and comes out to play, reveal and deceive. 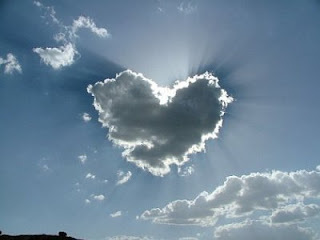 Moreover, CLOUD's results were published on August 24, 2011 when the Moon in Gemini/Ardra was in a mutual exchange (parivartana yoga) with Mercury in Cancer/Ashlesha. Ardra is a nakshatra associated with extreme and catastrophic weather changes and Ashlesha is a nakshatra associated with kundalini energy (cosmic rays) and with deception and intrigue. Thus by observing the astrological influences surrounding this announcement, we have additional intuitive evidence that there may be more to it than meets the eye. 'One has to make clear that cosmic radiation is only one of many parameters' is really a proof of his [Heuer's] prejudice. Whether the cosmic radiation is just one player or the only relevant player or an important player or an unimportant player is something that this very research has been supposed to determine or help to determine. An official doesn’t have the moral right to predetermine in advance what “one has to make clear” about these a priori unknown scientific results. The hypothesis that cosmic rays and the sun hold the key to the global warming debate has been rejected and suppressed by the global warming establishment ever since it was first proposed by two scientists from the Danish Space Research Institute at a 1996 scientific conference in the U.K. Although the Danes found themselves marginalized by mainstream science, well respected physicists such as Jasper Kirby were still interested and brave enough to convince the managing powers of CERN to sink some money into the CLOUD (Cosmics Leaving OUtdoor Droplets) experiment. According to Lawrence Solomon: It took Mr. Kirkby almost a decade of negotiation with his superiors, and who knows how many compromises and unspoken commitments, to convince the CERN bureaucracy to allow the project to proceed. And years more to create the cloud chamber and convincingly validate the Danes’ groundbreaking theory. Thus it is amazing that CERN, whose initial job description is arguably something completely different than atmospheric science, would spend 9 million dollars on a project with such a controversial hypothesis. And I find it somewhat ironic that CERN, the organization that invented the World Wide Web (the first gate to the virtual world) and built the Large Hadron Collider (LHC for short that some say is a star gate) to find the Higgs boson, the so-called God particle, is now stuck in the middle of the debate concerning the source global warming: whether it is a natural or man-made process. The contrast between the two worlds is intriguing and raises questions about the meaning of creation. The natural world is a creation or expression the divine god-mind, whereas the imaginary world of the internet is designed by the mental field of man-mind. Is Man imitating God, or worse seeking His magical power stored in an elementary particle? 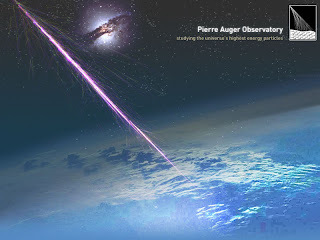 So much of CERN's work is hidden from the public eye that it makes me suspect of their motives and of their findings (even though I have said for years it's the sun and cosmic rays heating up all the planets in our solar system). And now that the director of CERN has publicly revealed his political bias and shut down scientists from making inevitable conclusions, it is clear there is more going on than we are being told. Even more starting than this new research that indicates global warming is a natural process, is CERN's recent the admission that the elusive Higgs boson particle, or God particle, may not exist after all. After months of reports of internal leaks and rumors that CERN scientists were on the brink of, or had found, the Higgs boson particle, they reversed gears and announced at the Lepton-Photon conference in Mumbai that their research shows a 95 percent probability that the hypothetical Higgs boson particle is nothing more than a figment of imagination (click here for more). This is a BIG deal in the physics world. Since 1963 the Higgs boson has been theorized by many in the physics community to be the elementary particle responsible for sparking the Big Bang, and thus the entire universe and everything in it. 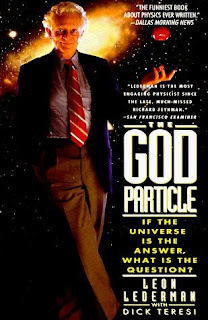 The Higgs boson is often referred to as "the God particle" by the media, taken from the title of Leon Lederman's book, The God Particle: If the Universe Is the Answer, What Is the Question? Lederman initially wanted to call it the "goddamn particle," but his editor would not let him. Many scientists dislike the nickname 'God particle' as it overstates its importance. The existence of the Higgs boson is postulated to resolve inconsistencies in theoretical physics. It is the only elementary particle in the Standard Model that has not yet been observed in particle physics experiments and is considered the Holy Grail by physicists who support this model. The Higgs boson particle is believed to be responsible for diffusing massive particles with their mass when the Universe was more youthful. In other words, the Higgs boson is part of a meta-narrative that physicists use to explain the creation of the Universe. So if the Higgs doesn’t exist, where does mass in the universe come from? Now it seems that theories that go beyond the Standard Model of particle physics may be taken more seriously. 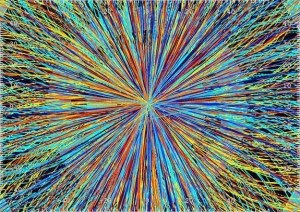 Of course not all physicists agree with the Big Bang theory or the existence of the Higgs boson. 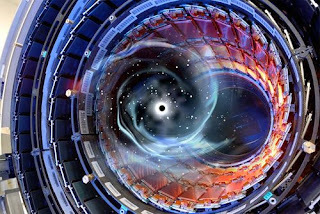 Even Stephen Hawking made a famous bet a few years ago that CERN's LHC, along with every other particle accelerator, won’t find the Higgs boson, the elusive ‘God particle‘, simply because it does not exist (click here). Looks like he may be right. Personally my own preference for theories like the cyclic universe described in the Endless Universe by Steinhart and Turok or Endless, Boundless, Stable Universe by Grote Reber comes from a feeling or belief that the universe is indeed infinite, and goes through periods of cyclic expansion and contraction. I find Nassim Haramein's unification theory far more promising than the Big Bang theory as it answers many of inconsistencies of theoretical physics. For example his work on the Schwarzschild proton strongly suggests that matter at many scales may be organized by black-holes and black hole-like phenomena and thereby lead to a scale unification of the fundamental forces and matter. (Click here for a link to more of Haramein's research papers.) Thus there are no elementary particles, only fractal levels with a black (w)hole at the center that goes on for infinity. While the scientists at CERN state that, with a 95% probability, the Higgs boson does not exist within the range of energies the LHC has so far explored, between 145 and 466 billion electron volts, there is still a 5% chance that the Higgs is hiding somewhere within this energy range. So the search is not quite over. Hmmm. So while CERN will continue its search for the Higgs at least until the end of this year, if no positive results about the Higgs should come out, Stephen Hawking—betting against the entire world of physics, as it were—would be able to cash in on his wager. And in that case, Congress may feel that even though its 1993 decision to cancel the American alternative to CERN—the Superconducting Super Collider—was generally met with chagrin by the American physics community, it may have been the right move one after all: to spend billions of taxpayer dollars in search of a particle that likely does not exist would have been wasteful. So what will happen to CERN now that two of its big experiments have proved the opposite of what they initially proposed? After taking 16 years and $10 billion to build, is the LHC headed for the garbage heap? Unlikely. Could CERN's LHC be used for something else? Or has all that money be used to study something else? Over the years CERN's quest for the so-called 'God particle' has raised a lot of controversy especially in conspiracy circles and in fundamentalist religious groups. 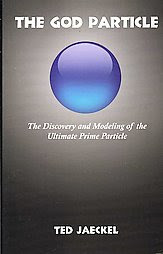 Perhaps spurred on by popular books and movies like Angels and Demons, based on Dan Brown's mystery thriller, whose plot involves stolen anti-matter from CERN, secret societies, and priests gone bad, many blogs and commentaries expressed fear that the accelerator would ultimately create a black hole and destroy the planet. The blockbuster movie Angels and Demons was released in May of 2009, nine months after the LHC was first fired up and six months before its first successful smash up. And of course CERN's logo has caused some conCERN as it is a stylized representation of 6-6-6, which only amplifies the apocalyptic themes associated with the LHC. Or perhaps it's the statue of Shiva Nataraja given to CERN by the Indian government to celebrate the research center's long association with India that castes a shadow over CERN's true purpose. In the Hindu tradition Shiva is the destroyer or transformer god among the Trimurti (Brahma, Vishnu, Shiva), the Hindu Trinity of the primary aspects of the divine. The two most common forms of Shiva's dance are the Lasya (the gentle form of dance), associated with the creation of the world, and the Tandava (the violent and dangerous dance), associated with the destruction of weary worldviews. The Lasya and the Tandava are just two aspects of Shiva's nature: he destroys in order to create, tearing down to build again. Assigned with destroying all of the universe at the end of time, CERN's Shiva appears to be guarding what some might call a doomsday machine capable of creating black holes that would destroy the planet. Others see CERN and the LHC as a secret military project designed to open up star gates or portals to other worlds as in the movie Contact. There was even a bizarre report of a "man from the future" who was arrested at the LHC claiming that he had travelled from the future to prevent the LHC from destroying the world (click here ). He mysteriously escaped. Author and investigative mythologist William Henry describes an intriguing similarity between the 8-spoked LHC and the 8-spoked wheel indicating a wormhole in Mayan cosmology. Henry writes: As I discussed in my DVD presentation, Stargate 2012, the Mayans say from out of this tree/star alignment comes a serpent rope with an enlightened being named Nine Winds or Quetzalcoatl riding upon it and a blessed substance’ or ‘sap’ the Mayans called itz (literally ‘the blessed substance’) apparently spewing from it.Usually, when one thinks of ‘sap’ they’re thinking of a watery liquid nutrient that circulates through the conducting tissues of a plant or tree (that or a person who acts like an idiot). However, when I Go(ogle)d, excuse me, Googled, ‘cosmic sap’ I found that ‘sap’ is also an acronym for ‘sub atomic particle’ (or sap). Hmm. Are the Mayans describing a ‘blessed sub atomic particle’ that will appear in 2012, give or take year or two? Is this the same as the God Particle? Some circles believe that CERN is punching holes in the space-time continuum resulting in unusual and unexplained phenomena like the Norway spiral. 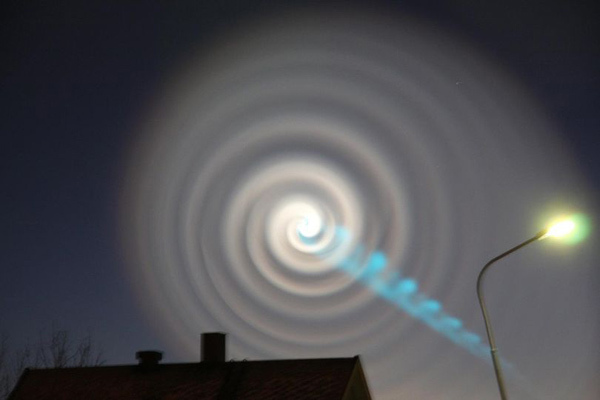 Was it mere coincidence that on December 9, 2009, 8 hours after CERN smashed together subatomic particles at the highest energies ever reached by a human-made accelerator (click here), the enigmatic Norway Spiral suddenly appeared over the morning skies of Norway (click here) a day before Barack Obama received the Nobel Peace Prize in Oslo. Two days prior to the big smash and Norway lights, the UN Convention on Climate Control, COP-15, the child of the 1997 Kyoto Protocol, began their annual two week meeting in nearby Copenhagen. Every year since the convention was established a conference takes place called Conference of the Parties, or COP for short, where the countries which have ratified the convention meet to discuss how they can meet the objective of the convention: to prevent global warming. According to the official Denmark website: "the goals of the climate change convention are to stabilize the amount of greenhouse gases in the atmosphere at a level that prevents dangerous man-made climate changes." Although the official policies were based on consensus among scientists that global warming is a driven by human activities and caused by the burning of fossil fuels in cars, trucks and power plants, the logo for the 2009 meeting was odd. So what inspired their blue logo which looks more like an image of an elemental particle than something to do with the planet earth like the previous and later logos of COP-14 and COP-16 both of which use a world tree image. 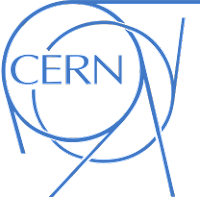 Isn't it a strange synchronicity that the logo bears a remarkable resemblance to CERN's particle imagery and same blue hue as the Norway spiral. It also bears a remarkable resemblance to images from the 2007 science fiction film The Last Mimzy. 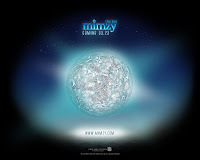 Presented as a flashback, The Last Mimzy is the story of a distant future's attempt to avert a catastrophic ecological disaster that has destroyed their world. Hmmm. And don't even get me started on the synchronicity of all these blue phenomenon and logos with the release of James Cameron's Avatar in December 2009. As I have written in previous posts I associate blue with the fifth and sixth chakras that vibrate in a blue frequency and correspond to truth and spiritual insight. There is also an element of fantasy associated with the blue chakras, like a desire for purity, or for the world to be other than it is. So what is with the blue of all these logos? It does resemble the electron cloud of an atom. Is it a blue particle? Does it remind you of anything? Remember the book cover from Jaeckel's The God Particle? What is this blue sphere? The great Hindu sage Swami Muktananda (1908–1982), who introduced Siddha Yoga practices and meditation techniques to the United Sates, gave a detailed description of the significance and of his experiences of what he calls the Blue Pearl: The Blue Pearl is the subtlest covering of an individual soul. 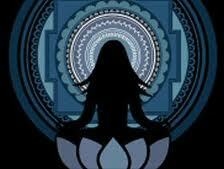 When we see this tiny blue light in meditation, we should understand that we are seeing the form of the inner Self. To experience this is the goal of human life. [The Blue Pearl] is tiny, but it contains all the different planes of existence. Thus a blue pearl might be compared to the speck of divine, or god particle, in each of us. My yoga teacher Katerina Wen first introduced me to the concept of the blue dot/orb in this video by Liquid Buddha. The video begins with an energetic representation of the blue lotus surrounded by white orbs and from which a spiraling dodecahedron emerges. It is an amazing visual representation of the energetic forces of consciousness. In his book The Oracle of the Illuminati William Henry reveals how historically this image was also called the Blue Apple, the Divine Blue Particle, and the Blue Stone. Henry writes: The expression blue blooded, and the meaning of blue skin, I believe, originally symbolized the idea of having the wisdom of the Word, the Divine Blue Being, pulsing in one's veins (vines). The closer one was to becoming the Blue Being the bluer one's blood ran and the bluer one's skin became. In his book Blue Apples, Henry also suggests that Blue Stones are an exotic matter that the gods, or extraterrestrials, used to create gateways and pass through to other realms. So now, two years later, CERN is releasing ground-breaking information on global warming and admitting the God particle may not exist, all under Mercury retrograde which may mean more revelation or scandal is coming. And even more disconcerting is the new logo for this fall's COP-17, a leafless and withering tree. Seventeen is a number associated with themes of salvation, hope and ascension. In addition to its obvious connection to the 17th major arcana Star card in the Tarot, blogger Christopher Knowles has been commenting on 17s association with Osiris, lord of the underworld, whose Egyptian feast day is the 17th of March, and how it relates to the Blazing star of the Masons in his blog, the Secret Sun. In his Stairway to Sirius series he illuminates the incredible synchronicity between apparently unconnected events that occurred in December 2009. They are all tied together by the symbol of the star, or "secret sun." Could the secret sun also be the blue pearl? Like the Hopi blue Kachina, the secret sun is suppose to reveal itself at the end of time. According to Vedic astrologer Prash Trivedi the number 17 is usually seen as a bringer of celestial waters down to the earth plane. Anuradha is the 17th nakshatra which presides over numerology and is known as the decoder of the secrets of the universe. Both Trivedi and Knowles contend that 17's magic goes back to ancient mystery cults of Egypt. Conspiracy writers believe it is used to trigger the subconscious mind and ready it for download. 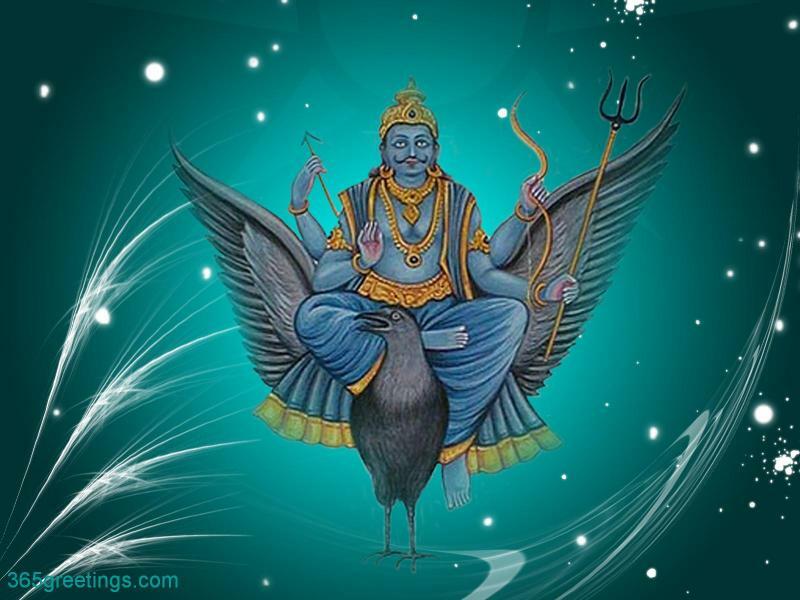 The nakshatra Anuradha contains three stars in the body of Scorpio. Although its primary symbol is the lotus flower, it's secondary symbol is an archway -- or portal. Just as the roots of a lotus are buried in the mud, they must grow and push the stem up through the water in the sunlight and release the delicately scented flower. This pattern of growth signifies the progress of the soul from the primeval mud of materialism, through the waters of experience, and into the bright sunshine of enlightenment. Thus the symbols of Anuradha reflects its ability to bring the flowering of consciousness out of the challenges of the murky material world and perhaps open up a new portal for our enlightened bodies to pass through. Anuradha is ruled by the planet Saturn, the blue deity who rules over time. Could the 17th nakshatra also be pointing to a blue stargate? After a year full of weather-related disasters such as the nuclear melt down following the 8.9 earthquake in Japan, drought and famine in Somalia, and record summer heat in much of the US, COP-17's world tree has lost its leaves and is barren. Let's hope the COP-17 leafless tree image is not forecasting the destruction of the world tree, but rather like the green Osiris, the hibernation period before the resurrection and return of the tree of life on our planet. May you reconnect with your own blue apple and raise the frequency on this beautiful blue pearl that we share and call Earth. 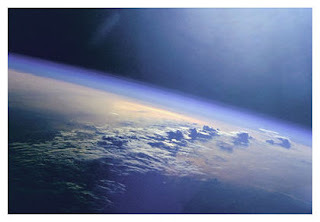 In my last post DisCERNing CLOUDs and God Particles I discussed the two startling announcements from CERN: that global warming may be a natural process driven by the Sun and cosmic rays AND that the so-called God-particle may not exist. It seemed curious that two of its most important experiments have proved the opposite of what they initially proposed. I also questioned what CERN might be up to next by examining some of the rumors associated with it, including its use as a star gate and producer of a "blue pearl." Today I want to look at CERN's CLOUD logo as there is a blue spiral and not-so-secret sun contained within it. These symbols seem to indicate that the source of global warming is indeed the Sun and cosmic rays generated from a black hole? Or so it seems. 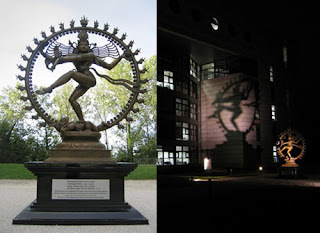 Although CERN is an acronym for Conseil Européen pour la Recherche Nucléaire, it is also a root of disCERN meaning to perceive with the eyes or intellect from the Latin cernere, to determine or separate. According to its website CERN's business is fundamental physics, finding out what the Universe is made of and how it works. CERN is searching for elementary particles by smashing atoms together in its 17 mile underground/underworld particle accelerator called the Large Hadron Collider (LHC). 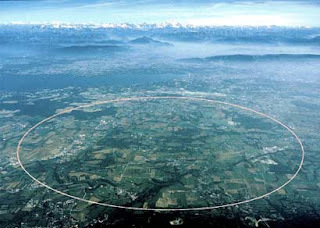 As I discussed in the previous post, 17 is a trigger number associated with portals and ascension, so some have suggested that this 17 mile tract at CERN may in fact be part of a giant star gate. Moreover, some of the acronyms for other LHC experiments include ALICE (as in Wonderland going through the rabbit portal) and ATLAS (as the Titan who holds up the world) perpetuate these sci-fi theories that new dimensions are being explored underground. CERN not only built the suspected star gate/Large Hadron Collider, but also invented the World Wide Web, which might be called a gate or portal to the virtual world. 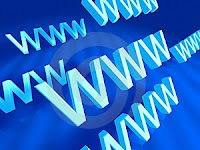 The World Wide Web is designated as www. When connected together the three Ws resemble the wavy line of electricity. 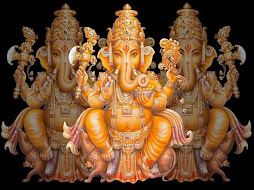 Three is a number in many religions most often representing the three manifestations of the divine such as the Holy Trinity of Father, Son, Holy Ghost, or the Trimurti in Hinduism -- Brahma, Vishnu, Shiva. Or might the three Ws represent three 24 hour days? In Genesis the third day was the day on which the Earth was caused to rise up out of the water, thus another connection with theme of the three dimensions of physical matter. And of course in the New Testament, Jesus arose from the dead on the third day linking www with Ascension themes. There are also apocalyptic prophesies that during the end times there will be three days of darkness. Catholic visionaries agree that the faithful should stay within their homes during this plague of darkness as most of the earth's inhabitant shall die. Even Hopi prophecies describe three days of darkness at the shift of ages. Could www describe a period of darkness not of literal lack of sun, but of retreat into a virtual world? 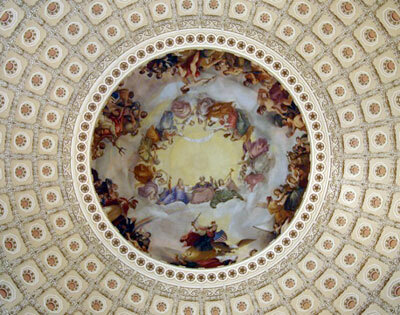 In the Apotheosis, Washington is encircled by a ring or ‘gate’ of 72 stars, a ‘stargate’. 72 is a code number that refers to the Precession of the Equinoxes, the 26,000 year cosmic cycle that comes to a close on December 21, 2012. The number 72 sends up ‘pay attention, incoming info’ flags to apocalypse code-breakers. They connect statements about it to 2012. When 72 years are multiplied by 360 degrees representing the complete circle of the Sun through the signs on the ecliptic, we discover that it takes is 25,920 years for the entire precessional cycle to be completed. This cycle is referred to as the Great or Sidereal Year. The Great Year marks periods of the expansion and contraction of consciousness as the Sun transits each zodiacal sign. The Great Year is divided into four world Ages: Satya (Truth or Golden), Treta (Third or Silver), Dwapara (Third or Bronze) and Kali (first or Iron). Each age describes a stage of awareness for mankind in which consciousness ascends, descends, and ascends in unending cycles. 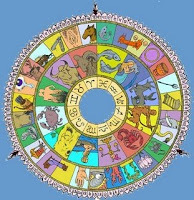 Precession of the Sun through the zodiac covers approximately 1 degree in 72 years. Thus the 72 of www is one degree of a circular path of the cycle of consciousness. 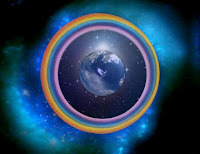 WWW is a gateway to the internet, a portal to near telepathic communication on the earth and its numerological connection to 72 indicates it too may be connected with cycles of consciousness. Moreover, we may push the numbers game even further and take the number 24 and reduce it to its numerological essence, ie 6 (2+4=6), making 6-6-6 that is echoed in CERN's logo. The Book of Revelation (13:17-18) cryptically asserts 666 to be "the number of a man," associated with the beast, a monstrous creature that appears briefly about two-thirds into the apocalyptic vision. WWW is certainly a world created by man and I'm sure some might call it a beast. In modern popular culture, 666 has also become one of the most widely recognized symbols for the Antichrist or, alternatively, the Devil. 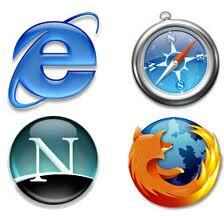 Even one of the most popular browsers on the internet, Firefox, has a symbolic association with the Devil. The wily fox is clever and master of illusion and a red (or fire) fox was a symbol for the Devil in Medieval Europe. And each letter of FOX is a 6 in numerology: F=6 +O=6 +X=6. In the Firefox browser a red fox gazes at the blue globe/blue pearl as it encircles the Earth with its flame-like tail. In the important ceremony which refers to the Northeast Corner of the Lodge, the Candidate becomes as one who is, to all outward appearance, a perfect and upright 7nan and Mason, the representative of a spiritual Corner-stone, on which he is to erect his future moral and Masonic edifice. and . . . the Northeast Corner, as the throne of God in hour of his majesty, became a place unique in the symbols of man, having special virtue and sanctity. The E of Microsoft's Explorer looks like an elementary blue particle or electron, and the name "explorer" resonates with the theme of navigation associated with the Mason's compass. The N of Netscape is may simply refer to a fishing net that captures information. 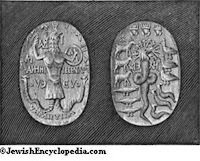 Or perhaps the N may stand for Nimrod/Nebuchadnezzar the 'mighty man' of Babylon who built the infamous tower of Babel and Blue Ishtar (star) gate. The N straddles the horizon with an interesting halo above the pillars of the vertical elements of the letter that resemble the Nordic Rune Hagalaz. This rune represents a shelter that one may take to protect oneself from the destructive force of natures' hailstorm. According to some interpretations Hagalaz represents a destruction that is necessary in order to bring about rebirth of a new world, or a new phase of one's life. I have CERtaiNly found that the internet can be a distracting rabbit hole for my restless mental field. 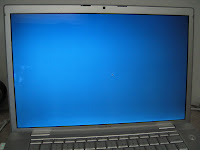 After literally getting sucked into the blue screen for hours, once I log off, I feel the same sense of lost time that abductees describe. The ubiquitous blue light that radiates from a computer (not to mention cell phones, and TV screens) may be likened to an artificial blue pearl that I discussed in my last post. It is a virtual representation of the blue god-spark imitated by the computer's creator, man. 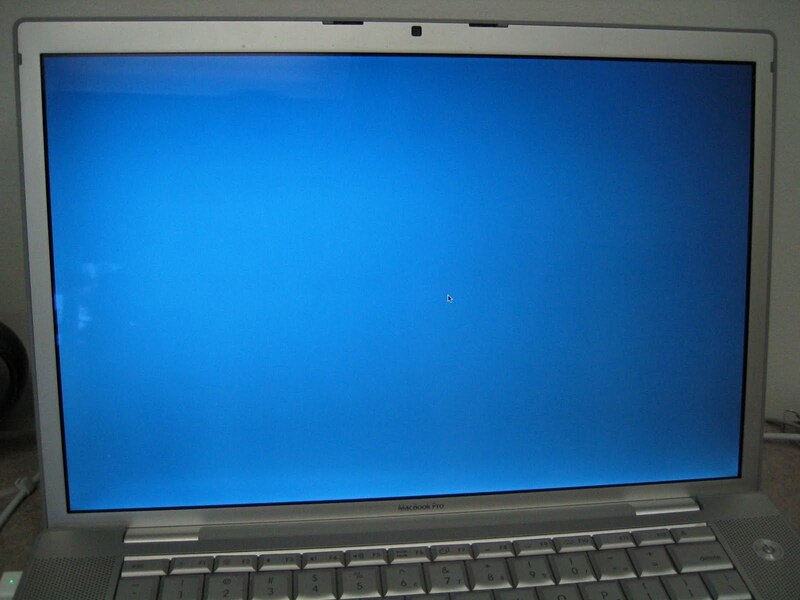 There is even a computer term called the Blue Screen of Death, or BSoD. It is an error screen displayed upon encountering a critical error, of a non-recoverable nature, that causes the system to "crash." Could we compare this computer crash to a human experience? How about when a human discovers the inner blue pearl and the "reality" of the physical world crashes. According to various texts in the Dead Sea Scrolls the Creator of this world, who is the God of Old Testament, was not the true Heavenly Father, or the Ultimate Supreme Being, that Jesus referred to in the New Testament. The Creator of this world is known as the Demuirge, an imposter and jealous being called Yaldabaoth. The Demiurge was created by a being called the Aeon Sophia, from the Greek meaning 'wisdom.' Sophia tried to emulate the invisible Heavenly Father by creating image of herself -- meaning that she wanted to produce an offspring without either consort or the approval of spirit. As an Aeon, or immortal being, she did have the power to do so, but she wasn't perfect like the great Heavenly Father, and this was an act of separation from divine totality. Thus Sophia gave birth to the monstrous Demiurge who was an ugly, imperfect creature with the body of a serpent and head of a lion, which sounds like some descriptions of the shadow planet Rahu of the Vedic tradition. Upon realizing what she had done Sophia cast her child out of the heavens and hid him within a thick CLOUD from the other Aeons, because of her embarrassment and shame. The child inadvertently stole a portion of his mother's power, so that she wasn't able to escape from the CLOUD. Keep in mind that Rahu is also described as appearing as 'smoke' or clouds and is sometimes called the artificial Sun. The Demiurge, isolated, did not behold his mother, nor anyone else, and thus concluded that only he himself existed. 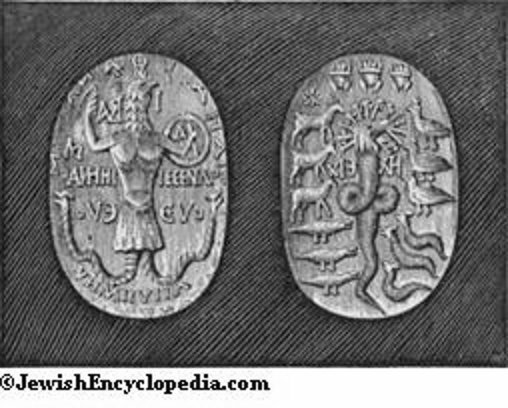 He is called Yaldabaoth, and was the first of the Archons, a Greek word that means "ruler" or "lord," and corresponds to the angels and demons of the Old Testament. In the Vedic tradition, Rahu is the significator planet of all knowledge as it represents maya - the illusory quality of nature. One could say that the Demiurge is the king of maya. Rahu is the karmic pull that brings our soul to manifestation on the Earthly plane, which the Gnostics believed was created by the Demiurge. In response the arrogant pronouncement of godhood by the Demiurge, his mother Sophia stretch forth her finger and brought limitless light into matter and into the region of chaos, which made her son trembled in fear. When Yaldabaoth and the other Archons heard her voice, they traced it to the abyss, where the Demiurge saw the reflection of his mother in the water. The Archons wanted to grasp the image but could not because they didn't understand that the image was reflected from above -- I guess he couldn't "look up." Rahu is also described as having a downward gaze. It was at this point that Sophia realized what she had done. She repented and prayed to her Father for deliverance and for the restoration of the power that her son had stolen from her. Next the voice of her Father, the invisible Spirit was heard, rebuking Yaldabaoth and the Archons. Again they trembled in fear, and saw the image of God, in human form, reflected on the water. Again in arrogance (and stupidity) the Demiurge desired to recreate the image of God from the reflection of the water. He called upon his children to assist in the creation of this image. Yaldabaoth tried to create a being in the likeness of the First Man, whom he called Adam, so he could steal its light (spirit). But this sorry creation of the Demiurge was lifeless and without a soul. It here here that Sophia saw her chance. In order to retrieve her power, Sophia tricked the Demiurge to blow life, which was her power and her essence into the face of Adam. When the Demiurge blew Sophia's power and spirit, as a blue pearl, into the first man, Adam became alive. 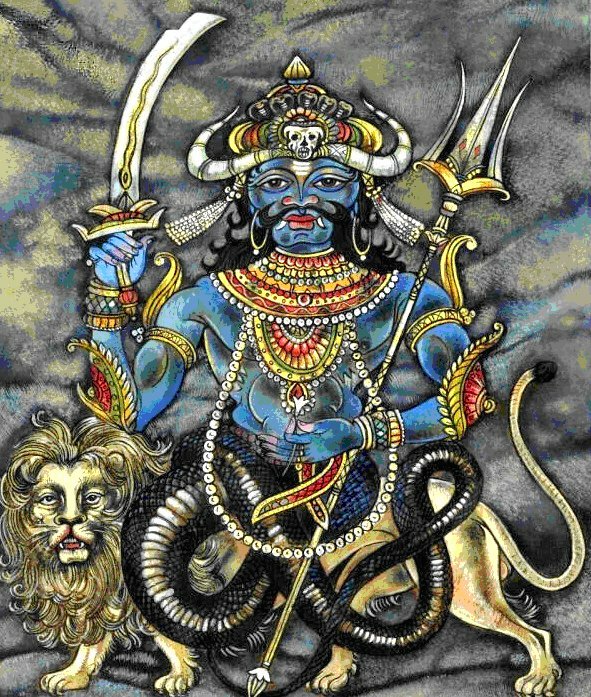 Like the Demiurge, Rahu also sought the immortal power of the blue Hindu gods promised by a sip of the elixir of immortality called Amrita or Soma. Soma is another name for the Moon, who rules the reflective mind and whose gem is the Pearl. Again we have this symbol of the Pearl bubbling up from the collective unconscious. Rahu chases the Pearl of the Moon and devours it during a lunar eclipse blocking our link to the reflective mind. Rahu is said to be the enemy of the Moon as it distracts us from the Truth. 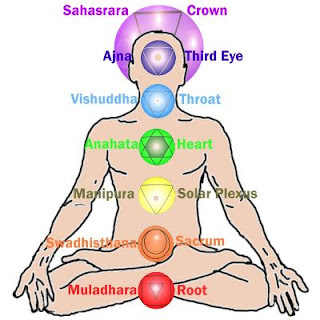 In yogic philosophy Soma/Amrit is a fluid that can flow from the pituitary gland at the third eye or indigo chakra down the throat to the blue chakra in deep states of meditation. It is considered an awakening and some yogic texts say that one drop is enough to conquer death and achieve immortality -- perhaps like the release of DMT - a lightening bolt from Sophia? Yaldabaoth immediately became jealous of Adam because his creation possessed this Blue particle and was more powerful and intelligent than him and the other Archons. The Archons saw that Adam was luminous and free of darkness and in a rage cast him into the lowest plane of existence (the Earth). The Archons wanted to confine Adam and imprisoned his soul in flesh making the material body mortal. It was the Archons that placed Adam in the Garden of Eden where they bound him in sleep and placed the bond of forgetfulness upon him. When Adam woke from his sleep, he saw a woman whose real name was Zoe, which means "Life", but is called Eve in Genesis. The Demiurge wanted to keep Adam and Eve ignorant of their true self and thus placed them in the false paradise, hoping to keep them as his slaves to worship him. Thus it is Yaldabaoth who told Adam that he may eat any fruit in the garden, but forbade him to eat from the Tree of Knowledge since the fruit of truth would allow them to see their true selves. According to the Gnostic tradition, it was Jesus who brought the apples to Adam and Eve, and not the serpent. So when I look at the logos of the most popular computer company, all I see are symbols of the Demiurge, a deity caught up in the deceptive thought-cloud of his immature mother, Wisdom, whose true power is in her immortal blue apple. 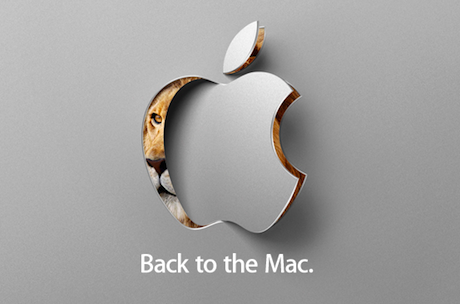 On June 6, 2011 Apple Inc. announced both its eighth and current major release of Mac OS X LION, its desktop and server operating system for Macintosh computers, AND its latest branding of Apple's CLOUD computing services that allows users to store data such as music files for download to multiple devices such as iPhones, iPods, iPads, and personal computers running Mac OS X or Microsoft Windows on computer servers owned by Apple. 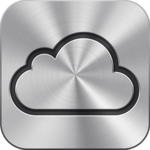 Would you want to store your personal information/thought patterns -- the "i" that links all these devices -- in a CLOUD protected by a hidden LION produced by a reflection of a Blue Apple? The Apple logo is one of the most recognized corporate symbols in the world. The first Apple logo featured Isaac Newton sitting under an apple tree with a quotation by Wordsworth imprinted on a ribbon banner: Newton . . . a mind forever voyaging through strange seas of thought. Well computers certainly have taken us there over the years. Soon this logo was changed into the familiar rainbow apple with a bite taken out of its right (NE) side. The rainbow may refer to Newton's discoveries of gravity (the apple) and the separation of light (the colors), but first and foremost it conjures up the apple from Tree of Knowledge in Genesis. The missing bite, or is it 'byte,' indicates that it is knowledge that is being consumed. For the last few years, the Apple logo has appeared in various colors , but now it is most ubiquitously seen in a white or blue hue. And here we are back again to the Blue Apple. 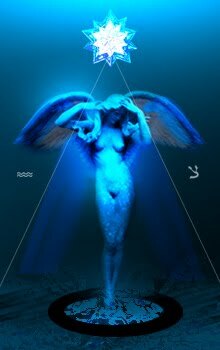 When the Gnostics put on the cloak of light they let go of their earthly attachments and attained Gnosis by activating an inner divine spark or scintilla called the Blue Stone, the Blue Light, the Blue Tone, the Blue Pearl, the Blue Apple. Our English word 'pearl' is derived from the Sanskrit [punita?] meaning pure. The Blue Apple as it is called in the Languedoc region of southern France, home of the Cathars (the 'Pure') is seen in the inner eye. With a lot of practice it can be followed into higher states of consciousness. Gnosis states that many can travel (out of body) into the higher realms, but to reach the land of pure AMOR, the pure spiritual worlds beyond time, space, matter and energy (the four nuclear forces), one must go through a deep zone of darkness that is impossible to traverse unless one is guided by the Blue Light. 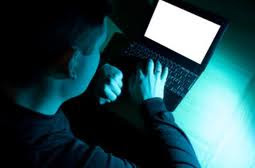 At the risk of sounding paranoid, I am beginning to wonder whether the creators of the internet, and all digital media for that matter, have created an artificial Blue Pearl that draws us like moths to a flame to the busy virtual world of the human mind. 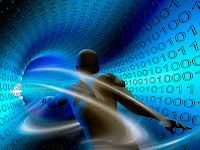 The internet may open up pathways for us to explore any topic imaginable, or connect with others around the world at lightening speed like a precursor to telepathy. The online traffic may be heavy and snarky, or light and philosophic, but it is all an illusion. Make that a double illusion -- an illusion of an illusion. We may be connected to our friends across the globe, but are we interacting with the live human sitting right next to us? This morning I was tempted to sit at my blue computer screen to finish this post, but instead chose to go to a yoga class and wait for the blue pearl, or blue lotus to reveal itself. And much to my surprise it did! It was beautiful, peaceful and calm -- nothing like the feeling I get after sitting at the computer for too many hours. When I walked out of the yoga studio the bright blue skies were rapturous. The radiant blue hue of mother earth is a true Blue Pearl that cannot be matched by any man-made device -- and we have that power inside each an every one of us! Again I pray, may you reconnect with your own Blue Apple and raise the frequency on this beautiful blue pearl that we share and call Earth. You will need to be conscious of it as we approach the three days of darkness. Let it shine and be a guide for yourself and other sentient beings. 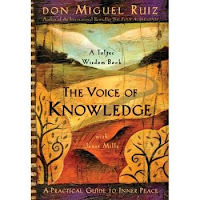 PS For more on understanding how to quiet the mind and break free from the CLOUD, I highly recommend Don Miguel Ruiz's book: The Voice of Knowledge. As I discussed in my last post iCLOUDs and Blue Apples, Gnostic symbols are emerging into the collective consciousness through the logos of companies and organizations associated with inter-dimensional gateways such as the World Wide Web and CERN. In particular Apple, the largest technology and publicly traded company in the world has created a line of products that incorporate symbols of the mysterious Demiurge of the ancient Gnostic tradition: the LION-headed serpent who resides in a CLOUD coveting the BLUE APPLE of man. The term Gnosis is a Greek word that literally means “knowledge," so isn't it intriguing that Apple has become the largest maker, seller, and gatekeeper of virtual knowledge in the world. The name iPod was proposed by Vinnie Chieco, a freelance copywriter. After Chieco saw a prototype, he thought of the movie 2001: A Space Odyssey and the phrase "Open the pod bay door, HAL! ", which refers to the white EVA Pods of the Discovery One spaceship. Chieco saw an analogy to the relationship between the spaceship and the smaller independent pods in the relationship between a personal computer and the music player. There can be no doubt that Kubrick had read Childhood's End and understood it's real significance. By aligning himself up with Arthur C. Clark, Kubrick was able to bring in these Gnostic, alchemical ideas through the convention of science fiction. 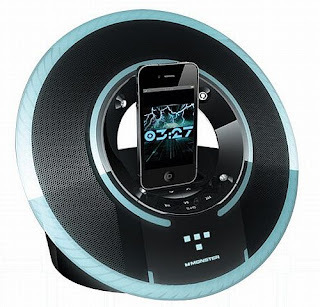 Thus Apple's appropriation of the EVA POD in the name of its "2001" iPOD suggests that the computer company was aligning itself with the future evolution of technology -- the integration of human and machine. However, in 2001: A Space Odyssey computers fail to make the final evolutionary transition of machines acquiring a soul. Instead the mysterious and possibly alien black monolith which appears to be the source of evolutionary change emits a signal that confuses the onboard computer, HAL (Heuristically programmed ALgorithmic computer), an artificial intelligence that was represented as a red television camera all-seeing "eye" on the spaceship Discovery. Comparative Mythologist John Lash points out in his book Not in His Image that the ancient Gnostics had a word that they used to denote the duplication of reality which was being foisted on us earthlings by the evil demiurge. The word that they used for this simulation of reality was HAL. Thus the gnostic word HAL describes what today might be described as computers and the Internet; and Apple is leading the way in its world wide dominance of duplicating reality. As I proposed in my last post, the ubiquitous blue light that radiates from computers, cell phones, TV screens, and other digital media devices may be likened to an artificial blue pearl, a virtual representation of the blue god-spark imitated by the computer's creator, man. The light of the artificial Blue Pearl draws our thought-minds like moths to a flame and distracts us from the true light not only of the physical world, but also from our inner light. As we have seen throughout this series of posts the World Wide Web developed by CERN is also connected to sci-fi themes like star gates and wormholes indicating that www can lead us to new worlds. The World Wide Web is a service that grants users access to the Internet, the "internetwork" of multiple computers with special gates ways or routers. Their nicknames 'Web' and 'Net' are suggestive of traps that ensnare our collective minds by promising 'connection' which is an illusion spun by the masters of maya -- ourselves. The Web may open up pathways for us to explore any topic imaginable, and connect with others around the world at lightening speed like a precursor to telepathy, but are we connecting to those sitting next to us? Are we merely fish swimming in a stream of group mind not noticing what exists outside the school -- or of the lurking mastermind setting those traps -- our egos? Will we allow our souls to be sucked into the Matrix of a virtual world, or will we saved by an evolutionary intervention like the black monolith? In my last post I continued the discussion about how certain images denoting the Gnostic Demiurge are used in logos and product names of Companies associated with inter-dimensional gateways and virtual knowledge. 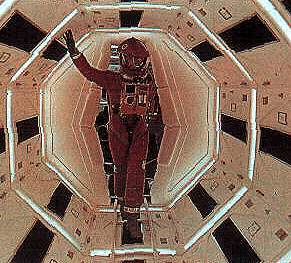 In particular I described how Apple named it's "i" line of technological devices: it was inspired by Stanley Kubrick's sci-fi movie 2001: A Space Odyssey about the evolution of man and technology. In the movie a computer named HAL is the antagonist. HAL stands for Heuristically programmed ALgorithmic, more commonly known as artificial intelligence, or AI. HAL is also a word in the Gnostic tradition to describe the duplication of reality that was being "foisted" on humans by the false God, or Demiurge. 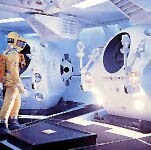 I believe that the Gnostic meaning of HAL describes what today might be described as computers and the Internet and that Apple is leading the way in its world wide dominance of duplicating reality. 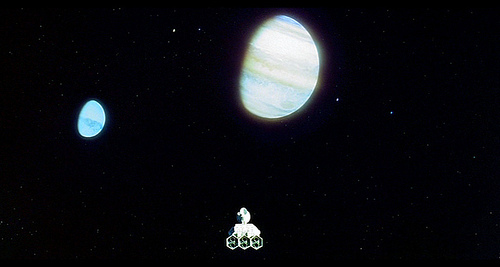 When you look at the first images of 2001: A Space Odyssey guess who opens the gate to the movie: the MGM Lion. Although I didn't discuss MGM in my epic post on Stars and Hollywood, it was also one of the original motion picture studios designed to duplicate reality on film. The roaring lion was adopted when MGM was created in 1924 by merging Metro Pictures, Goldwyn Pictures Corporation and Louis B. Mayer Pictures. Leo the Lion had been incorporated into a logo by Howard Dietz for Goldwyn Pictures in 1916 as a nod to his alma mater's mascot, the Columbia (there she is again -- you'll have to read the Stars and Hollywood post for more) University Lion. He designed the lion under a ribbon of film imprinted with the studios motto: Ars Gratis Artis, Art for Art's Sake. Below the lion is a theater drama mask alluding to Greek theater which combined religion and drama in ritual associated with the ancient greek demi-god Dionysus. 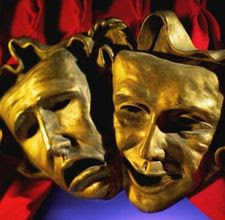 The two faces of tragedy and comedy are usually depicted when using this symbol, but the MGM only has one mask -- comedy. A tragedy's plot consists of a serious action that stirs up feelings of pity and fear and triggers a catharsis for the audience opening them up to new dimensions of understanding. It is in fact a portal to an emotional experience on the astral plane. Due to the tragic hero's ego and fatal flaw, he will encounter a "undeserved" tragic "fall." Sound like some "false god" we know? But instead the designer of the MGM logo chose a comedy mask. A comedy's plot focuses on an ordinary problem that regular people face and the comic hero may not have high morals, but he will have enough magnetism to win the audience. The difference in these two heroes seems to reflect the difference between the Demiurge, whose tragic ego caused a fall, and humans, regular people who plod along unwittingly. 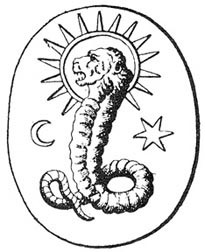 Notice that the Demiurge lion is on top. What's more is that MGM never uses the mask of tragedy in their logo. I also find it interesting that the logo never portrays the body of the lion, which very much resembles the Lion used in Apple's iCLOUD logo. I can't help but imagine that Leo the Lion has a serpent tail. The ribbon of film beneath the circular banner sure resembles snakes like those in the hair of the Gordon/Medusa, or like the legs of Abraxis (an embodied form of God that includes the Demiurge). 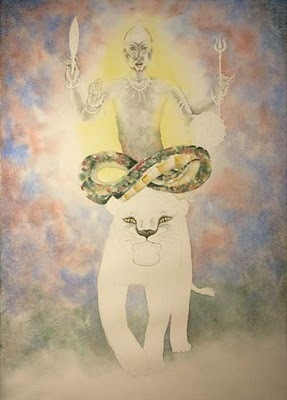 Could MGM's lion be a subconscious version of the Demiurge that was transmitted through the imagination of the artist? The MGM logo is one of the most famous logos associated with film, make-believe and alternate realities (not to mention mind control, as in its iconic Wizard of Oz in which the Lion becomes a lovable character somewhere over the rainbow -- click here for more on that story). It is as though the master of illusion has transmitted its own image through the imagination of the designer to be broadcast through the media into the three dimensional world as a symbolic trigger to the collective mind. A different logo, a circular still graphic image of a lion known as "The Stylized Lion", appeared on three films in the 1960s: Grand Prix (1966), 2001: A Space Odyssey (1968), and The Subject Was Roses (1968). The 1968 stylized logo has a framed gold lion above the letters MGM. In numerology M=4 and G=9, so M(4)+G(9)+M(4) = 17, the number associated with star gates. Thus with a roar the movie begins as we are transported into space. The first shot of the film is a mesmerizing celestial alignment of the Sun, Moon and Earth to heightened by the dramatic soundtrack of the World Riddle theme from Strauss' Thus Spoke Zarathustra. Right away, from the beginning, Kubrick is showing the viewer the relationship between the writings of the philosopher Frederick Nietzche and his film, between transformation and extinction. The Zarathustra essays by Nietzche are his most revealing and magical. Zarathustra is the great prophet of the Zoroastrians, who are the early holders of the great alchemical tradition. Kubrick is saying that this film echoes the words of Zarathustra who taught of the great transformation from the mundane to the angelic. This is one of the most dramatic openings in the history of the cinema. It is important to note that these magical, celestial alignments are dotted throughout the film and that they hold a key to the main theme. Weidner believes the celestrial alignments to be lunar eclipses, but it is difficult to distinguish which of the two globes are Earth and Moon, so it could also be a solar eclipse. Technically, an eclipse is defined as an astronomical event in which one celestial object moves into the shadow of another, and Kubrick provides glimpses of these alignments with Jupiter and its satellites. Although any planet or moon can be involved in an eclipse, here on earth our energetic lives are dramatically shifted during lunar and solar eclipses as mysterious shadows cross the luminaries. A solar eclipse occurs during a new Moon when the Moon conjoins the Sun and aligns with a shadow point called a lunar node that blocks the light of the Sun. A lunar eclipse occurs during a full Moon when the Sun and Earth align with the lunar node casting a shadow across the Moon. These lunar nodes, or orbital nodes of the Moon, are points where the orbit of the Moon crosses the ecliptic -- the apparent path of the Sun across the heavens against the background stars. 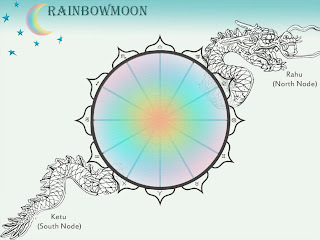 The ascending node, also known as the dragon's head, is where the moon crosses to the north of the ecliptic. The descending node, the dragon's tail, is where it crosses to the south. In Vedic astrology Rahu, the north node, and Ketu, the south node, are called shadow planets, chayya grahas. According to ancient seers like Parashara and Jaimini, Rahu represents knowledge, whereas Ketu represent liberation. The Rahu-Ketu axis embodies the polarized karmic forces that pull us to incarnate into matter on the Earth and mark the timing of certain struggles that the soul must endure to reach the highest knowledge of self. This timing is often initiated during eclipse periods. Thus it is intriguing from an astrological viewpoint that Kubrick initiated scenes of evolutionary shift with the celestial exclamation point of eclipses that ancient seers saw as signals of karmic shifts. 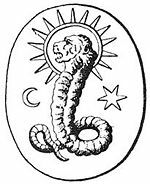 As I have mentioned in Part II of this series, Rahu and the Gnostic Demiurge are described as having the body of a serpent, with the head or symbol of a lion; they both rule over CLOUDs and artificial dimensions; and they are both chasing the BLUE PEARL. As we shall see, these two archetypes are so similar that it seems they bubble up from the same frequency of subconscious and trigger portals that open to mysterious worlds. In the Vedic tradition, Rahu is the significator planet of all knowledge that is temporal called maya - the illusory quality of nature. Rahu initiates the karmic pull that brings our soul to manifestation on the Earthly plane, which as we have seen, the Gnostic tradition suggests was created by the Demiurge. Like the Demiurge, Rahu rules over the astral world from his shadowy position. He creates smoke and obscures the truth causing fear and confusion. Rahu is also associated with clouds as it has the ability to temporarily hide the Sun. 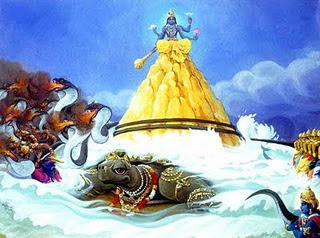 Rahu's ambition and lust for power are described in the ancient Hindu creation story of Samudra manthan, the churning of the celestial Ocean of Milk (the Milky Way). According the Puranas, the devas (gods) and asuras (demons) joined together in a pact to churn the waters of the Ocean of Milk. The naga (serpent) king Vasuki was wrapped around the mountain Mandara, and with devas at the tail of the snake and the asuras held its head, they alternately pulled on it which caused the mountain to rotate and thus churn the ocean. As a result of this churning action all the impurities of the ocean were released and manifested as Halahala, a dangerous poison. This poison terrified both the gods and demons because it was so toxic that it might have destroyed all of creation. The devas approached Shiva for help and protection. Out of compassion for living beings, Shiva drank the poison in an act of self-sacrifice. But before he could swallow the Halahala his wife and consort Parvati, who was afraid that it would kill him and end all life, intervened and prevented the poison from descending into his body. Thus the poison was stuck in Shiva's throat, and with nowhere to go it turned the color of Shiva's neck to blue. And so one of Shiva's names is Nilakanta, the blue-throated one. After all the impurities were removed from the cosmic ocean, various treasures emerged from the churning waters: plants, animals, Shree (the goddess of prosperity) and most significantly the celestial physican Dhanvantari who brought forth a pot containing Amrita, the nectar of immortality. It was believed that any being who drank of this divine elixir would live forever. The asuras immediately grabbed the pot of amrita for themselves, breaking a pact that all the spoils of the churning would be shared equally between the two camps. The devas were terrified and did not want the asuras to have immortality because they feared the demons would use it for the wrong purpose. To make sure that it would be shared equally the great god Lord Vishnu transformed into the form of a woman called Mohini, whose job would be to distribute the amrita fairly. However, even the god Vishnu had a deceptive plan to ensure that the devas would finish drinking the nectar first and keep the asuras from having their fair share. Most of the demons were tricked by the distractingly beautiful Mohini, except for the Swarbhanu, who was smarter than all the others, and who had himself devised a plan to secretly drink the divine nectar of immortality before his turn. 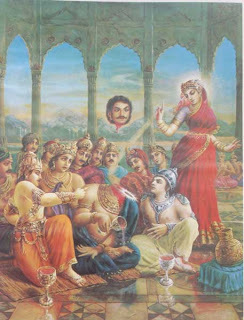 However, just as Swarbhanu was to receive the cup, the sneaky asura was spotted by the Sun and Moon who immediately alerted Mohini to his deception. This act of the luminaries ultimately made them the enemy of the Nodes. In the moment that Swarbhanu was about to finally have his divine draft, Mohini cut off his head, but not before the life-sustaining fluid had touched his lips. 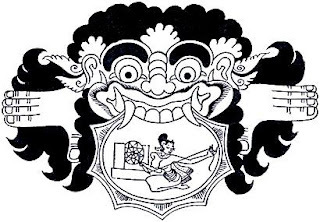 Although his head was separated from his body, Swarbhanu had gained immortality and would live for ever in this disembodied state as Rahu, the head, and Ketu the Tail. Because of his ardent desire for divine nectar amrita, Rahu is associated with intoxication and is an indicator of obsession with power, fame, and immortality. Amrita is also called soma, one of many names for the Moon, the planet that rules the reflective mind, whose gemstone is the luminous pearl. Just as the Demiurge sought the blue pearl, or divine spark, that it witnessed in Adam, so too does Rahu chase after the Moon desiring its soma and light. Rahu devours the Moon during a lunar eclipse temporarily blocking it from reflecting the life-giving light of the Sun to the Earth and from illuminating our reflective minds. But Rahu cannot hold onto the Moon as it has no body to hold or digest it. Like the Demiurge, Rahu is forever chasing what it can never have, a physical body. In yogic philosophy amrita/soma is described as a fluid that can flow from the pituitary gland at the third eye, or indigo 6th chakra, down to the throat, or blue 5th chakra in deep states of meditation. It is considered a sign of awakening and some yogic texts say that one drop is enough to conquer death and achieve immortality. I find it fascinating that amrita is manufactured and processed in the blue chakras that rule inner knowledge (indigo) and truth (blue) since blue is a color associated with Rahu -- the significator of knowledge. 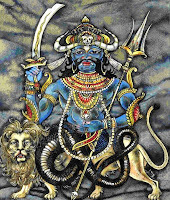 And of course Rahu is associated with the head and throat since he was separated from his body and its lower chakras. The third-eye chakra is an indigo-colored energy center located between the brow that is often marked in Hindu tradition by a red bindi meaning "a drop, small particle, or dot." 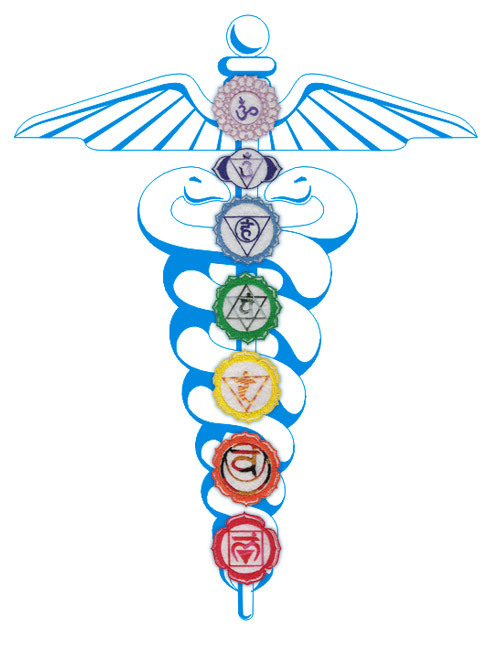 According to some beliefs this 6th chakra is the exit point for kundalini, the serpent energy of the ida and pingala that winds up the shushumna, or central channel, like two snakes of light. The bindi is said to retain energy and strengthen concentration at the third eye and to protect against demons or bad luck (or Rahu) like the "evil eye" in the Middle East that is also made in both indigo and blue hues of the 6th and 5th chakras. 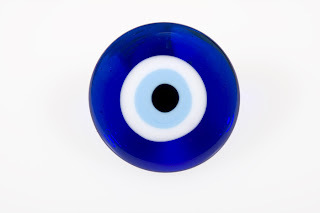 There is some speculation that the Gnostics also believed in the evil eye tradition (click here). The indigo third-eye chakra presides over our ideas about reality and our ability to manifest that reality. And, like Rahu, it rules our intuitive and psychic knowledge. The throat chakra is a sky-blue colored energy center just below the Adam's apple (oh that BLUE APPLE again) in the throat that regulates communication and our ability to express ourselves. It presides over creativity and truth. Historically the color blue is associated with truth and fidelity as in the sayings 'true blue’ or 'something borrowed, something blue' for longevity in marriage. The many shades of the color blue used in advertising and business logos are used to evoke a calmness and instill confidence in their message and ability to get the job done. 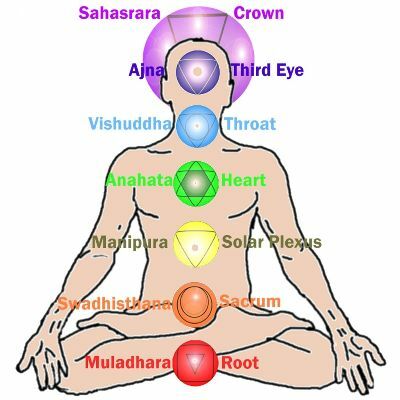 But there is another other side of the blue chakras: an element of fantasy and illusion which may begin in the third eye chakra through its connection to the astral plane and then becomes expressed through the throat chakra. 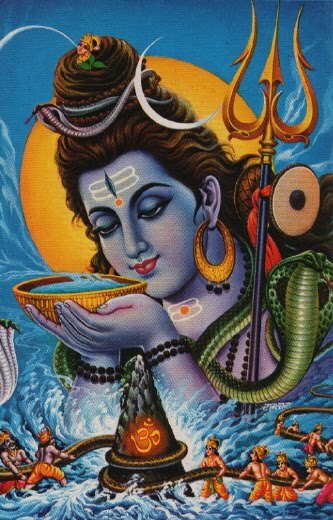 Don't forget that the churning of the ocean also produced a deadly poison that turned Shiva's throat blue. 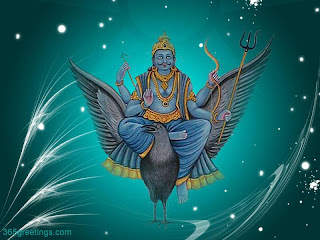 In addition the sky blue color of the 5th chakra may have more to do with the planet Saturn, the lord of time and truth, than Rahu, at least when it's operating in a balanced way. I link the sky blue of the 5th chakra with Saturn, who in the Vedic tradition has blue skin and is associated with truth. Although traditionally Saturn is associated with the 1st or Root chakra -- here I'm referring to its blue radiation. Saturn and Rahu share many attributes and qualities. 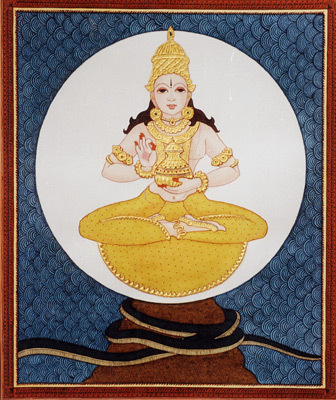 Like Rahu, Saturn is not fond of the Sun, who in the Vedic tradition is his Father. The Sun conceived Saturn with his wife's double, Chaya, a shadow that she left behind in her place because the Sun was so full of himself. Thus Saturn is born from the shadow of the divine feminine, just as Rahu is born from blow by Mohini, a feminine incarnation or shadow/illusion of the great Lord Vishnu. And like the nodes, Saturn has the power to eclipse the luminaries bringing his own brand of darkness, devastation, disease and most of all fear. Rahu and Saturn co-rule the sign of Aquarius which gives them both a vata, or airy, temperament. Aquarius is the sign of technology and computers, and as we saw in part II of this series, connected symbolically to the www of the World Wide Web. Rahu's close relationship with Saturn can be seen from the fact that it represents Ultra Violet light, which falls just before the Violet light of the visible spectrum represented by Saturn. 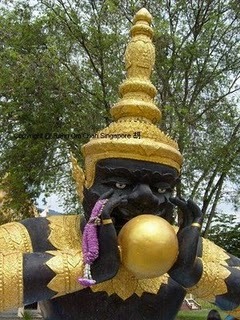 In this way Rahu can be seen as a higher octave of Saturn. The fact that Ultra Violet light is not visible to human eyes highlights the more mysterious functionings of Rahu as compared to Saturn. It is an intriguing concept that Rahu's influence lays outside the realm of visible light and that it is a higher frequency than visible light. So another similarity between Rahu and the Demiurge is that they exist outside of human perception and the material realm. And isn't it an intriguing coincidence that in the human body, amrita is released in the 6th chakra, one step above the 5th. 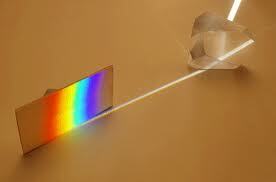 In addition, many insect species that rely on nectar can see light with frequencies outside the visible spectrum. 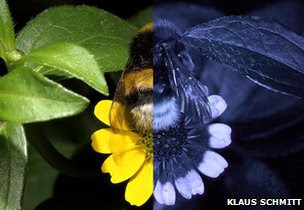 For example, Honey bees have eyes with spectral sensitivity in the green, blue and ultraviolet (UV) range. 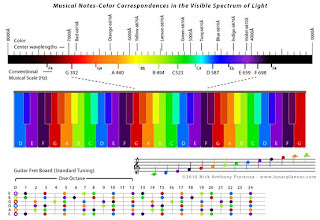 Amongst these colors the power to distinguish UV is the sharpest. Just as Rahu was drawn to the nectar of the gods, so too are bees drawn to the nectar of flowers. Birds can also see into the ultraviolet range and many have markings on their plumage that are only visible in the ultraviolet light. These birds appear to use their UV vision for mating and feeding. And Rahu's favorite species, ants, also have UV sensors (feeding ants is one way of propitiating Rahu). The seven chakras of the human energy field are represented in the seven colors of the visual spectrum -- violet, indigo, blue, green, yellow, orange and red. One of the earliest references to sunlight being composed of seven components come from the Vedic text Samba Purana called Surya Ashtaka hymns. In this text the Sun is identified as a lustrous chariot riding seven horses. In the 17th century our apple-inspired physicist Sir Isaac Newton was the first to explained the optical spectrum in his book Opticks. 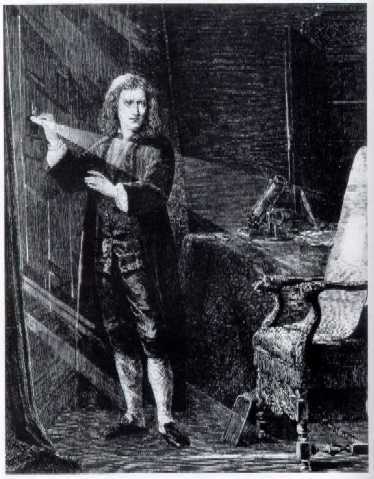 Newton used the word spectrum, from the Latin for "appearance" or "apparition" to describe his optics experiments. This word selection is an interesting choice as Rahu rules psychic phenomenon like ghosts. When Newton observed that sunlight was reflected and broken into different colored bands, he hypothesized that light itself was made up of particles of seven different colors: red, orange, yellow, green, blue, indigo, and violet. 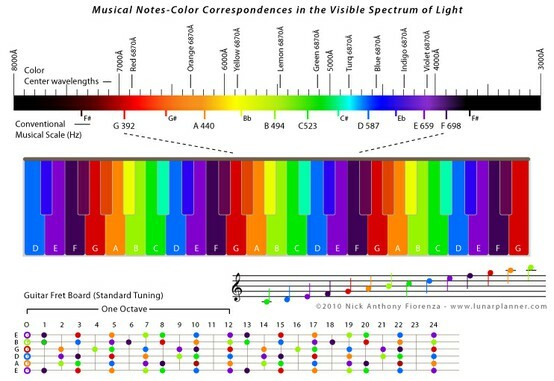 It turns out the secret of color is all in its light waves. Light, like matter, is made up of tiny particles, but unlike matter, these particles are not atoms or molecules but tiny packets of energy called photons. Could the blue particle sought by the Demiurge and Rahu simply be photons -- light? Newton chose seven colors out of a belief, derived from the ancient Greek sophists, that there was a connection between the 7 colors, the 7 musical notes, the 7 known objects in the solar system, and the 7 days of the week. Color scientists typically divide the spectrum at about 450 nm between violet and blue, with no indigo. Ah, like Rahu's Ultraviolet light, indigo is beyond the vision of most humans. According to Trividi: The Sky was also seen as a signification of Rahu by ancient Vedic seers. The shade of blue, which the sky has after sunset, was considered the color most favored by Rahu. Although indigo is best seen at dusk on a clear night, I find the night paintings of Vincent Van Gogh to best represent this illusive color. 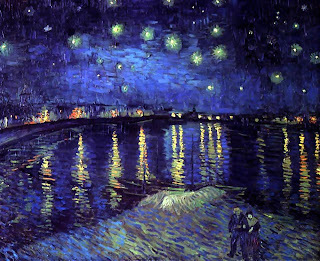 Although visionary painters may be able to create the color indigo on their canvases, some say that computer screens can not render it. However, I believe they can and do, and that it may have subliminal and hazardous effects. There is a potential for retinal injury called Blue Light Hazard. The mechanisms for retinal injury are caused by the absorption of light by photoreceptors in the eye. Under normal conditions, when light hits a photoreceptor, the cell bleaches and becomes useless until it has recovered through a metabolic process called the visual cycle. However, absorption of blue light has been shown to cause a reversal of the process where cells become unbleached and responsive again to light before it is ready. This greatly increases the potential for oxidative damage. By this mechanism, some biological tissues such as skin, the lens of the eye, and in particular the retina may show irreversible changes induced by prolonged exposure to moderate levels of UV radiation and short-wavelength blue light. In other words, blue light may make us unable to see and perceive clearly. Until recently, scientists believed the rod and cone photoreceptor cells were the primary cells responsible for light sensitivity. But now research has shown that ganglion cells may be acting as a third type of photoreceptor called “intrinsically photosensitive retinal ganglion cells” (ipRGC) which are most sensitive to blue light. The ipRGC help differentiate between day and night and modulate the "sleep/wake" cycles? Could this be why a blue LED light on alarm clock is said to interfere with sleep. Could a common component used in consumer electronics lead to eyestrain, headaches, disturbed sleep, and even increase the risk of cancer? It sounds alarmist, but in fact the first three of these claims are accepted as fact by experts in relevant fields – the last, the risk of cancer, is unproven. So what's the deadly component? The blue LED. Yes, those bright blue sparks of light on mobile phones, PCs, toasters, TVs, monitors, air purifiers, medical equipment, electric toothbrushes, and thousands of other products. Blue light appears to be a kind of natural alarm clock that wakes animals as the sky becomes blue after sunrise. Only a fairly narrow band of frequencies centered around 'blue' has this strong impact on melatonin. Light centered in this blue part of the spectrum is known to suppress levels of melatonin, sometimes referred to as the 'sleep' hormone, that plays a key role in regulating the sleep cycle. Might this also apply to our consciousness cycles of wake and sleep, ie enlightenment. Could the blue digital screen interrupt our sleep state to induce a sleep-walking state during which we are susceptible to suggestion? We appear to be fully awake, but it is an altered state of consciousness during which we interact with an alternate virtual reality. Hmmm. Rahu is said to be the enemy of the Moon which makes it an enemy of our mind. It's desire for knowledge can distracts us from the truth of our true selves. The lower functioning of Rahu is constantly seeking knowledge and power associated with the manifest material world. The X-Files motto the truth is out there reflects Rahu's obsessive search in the mental and emotional realms of the outer, physical world. But Rahu is also the planet of intuition, extra sensory perception, and other phenomenon related to the astra plane, the dimension shared with the Gnostic Demiurge. As we have seen the artificial blue light of modern technology seems to tap into a field associated with these archetypes which may not be healthy for our bodies, minds, or spirit. In the next installment in this series, I will go even deeper into the rabbit hole to observe the blue skies of the astral plane. 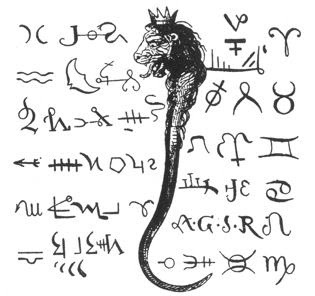 In the post you stated "Rahu and Saturn co-rule the sign of Aquarius..."
The two zodiacal constellations Pisces and Aquarius taken together are the fish-man of the Dagon and related to the Pope and the Catholic Church. This fish-man is Oannes, John the Baptist. 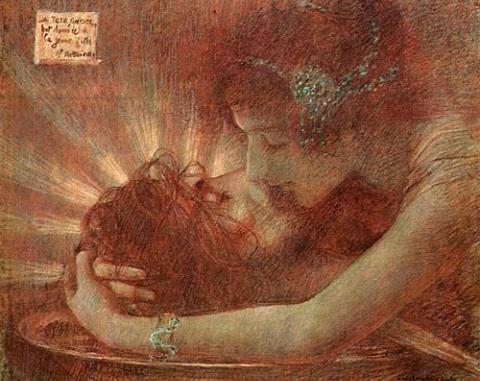 In the Salome story, the path of her dance is the river constellation Eridanus. The river ends near Pisces/Aquarius. Aquarius is a man bent over, holding a jug. The jug is the severed head of John the Baptist. If one switches to the story of Perseus and Andromeda, Aquarius is Perseus bent over after he has cut the head off the Medusa. The nearby constellation Pegasus is the creature that sprung from the drops of blood spurting from the dying Medusa. Earlier in your blog post you referred to Mohini and had a picture. Mohini is Salome, cutting the head off of John the Baptist, but this time doing it herself by throwing a disc. That disc is the "ring" or "spiral" nebula M33 found in the "hand" of the Andromeda constellation. Magic is Persian, so I'll go back again to Perseus and Andromeda. In that story, the M33 nebula is the shakle that holds Andromeda to a large stone as she is put out to placate Cetus. Just as we are all bound up in various ways at the current time (Andromeda means "man in the middle"), Perseus (Persia) comes and breaks the binding of M33 or the "ring." This is why Persia, I believe, is still in the end-game of the world take-over of "disembodied" (like Rahu) corporations. In its third paradigm-shifting announcement this month, CERN reported that its OPERA experiment has unexpectedly recorded subatomic particles traveling faster than the speed of light (click here and here for more). If correct this discovery would totally change one of the fundamental laws of physics: that the speed of light is absolutely constant making the basis of the most famous physics equation E=MC2 flawed. The speed of light -- 186,282 miles per second -- has long been considered a cosmic speed limit, not to mention the holy grail of time travel theory and the legendary propulsion theory of science fiction: WARP speed and drive. As any Star Trek fan will tell you WARP drive is a faster-than-light (FTL) propulsion system that creates an artificial "bubble" of normal space-time which surrounds the spacecraft as it travels through regular space (as opposed to entering a separate realm or dimension like hyperspace). 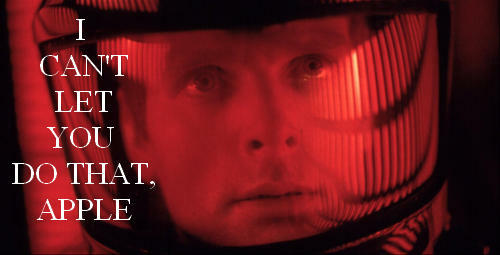 If today's announcement is correct, we are one step closer to going where no man has gone before. Once again CERN has validated, on the tipping point of the autumnal equinox, something that my intuition has "felt" to be true: that there are things that move faster that the speed of light. 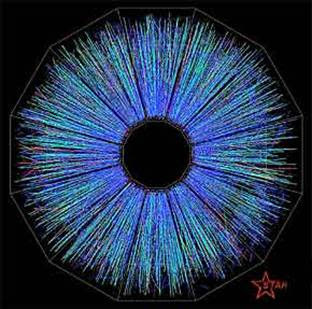 As I described in my last post, light, like matter, is made up of tiny particles; but unlike matter, these particles are not atoms or molecules but tiny packets, or quanta, of energy called photons. One of the most intriguing phenomenons associated with photons is Quantum Entanglement. It is amazing that photons can react to one another instantaneously defying the speed of light rule. Most physicists would counter the conclusion that these photons are somehow mysteriously communicating with each other by explaining that what ever is going on between the entangled pair is not information traveling faster that the speed of light. They might suggest it has more to do with how we view separation in distance and our ideas about locality than it does the speed of light. But now with CERN's discovery, the rules of entanglement may change too. Just think of the potential for intergalactic communication. Instead of taking 4 years traveling at the speed of light to reach to the nearest star system, Alpha Centauri, a message encoded in a beam of light might be transmitted in an instant. I believe this is how crop circles are transmitted to the earth by extraterrestrials from great distances like Arcturus, and why we haven't been able to measure the source of these 'superluminal' messages -- "like love letters slipped under the door at night" -- as it's outside our radar and ability to detect. 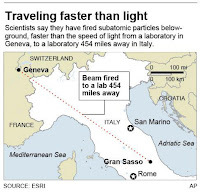 On Thursday a team of experimental physicists at CERN reported that one subatomic particle may be able to break the light barrier: the neutrino. Neutrinos are fundamental particles that are electrically neutral, rarely interact with other matter, and have a vanishingly small mass. They exist all around us. The Sun produces so many neutrinos as a by-product of nuclear reactions that many billions pass through our eyes every second. 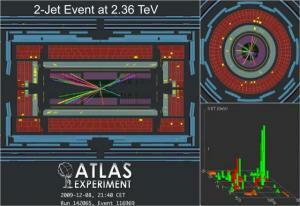 CERN creates artificial neutrinos by accelerating particles at the Large Hadron Collider (LHC). 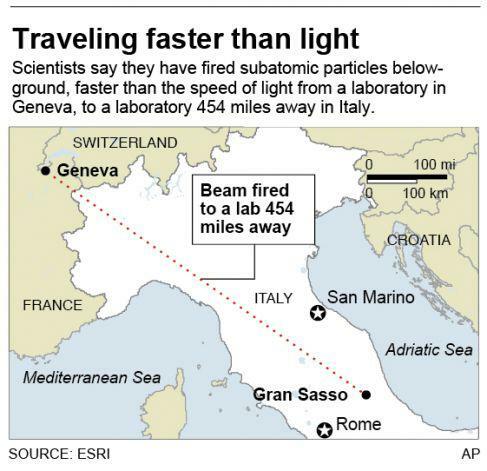 CERN scientists reached their conclusion after sending streams of these neutrinos hurtling from the accelerator at CERN outside Geneva, Switzerland to a detector at the Gran Sasso ("great rock") National Laboratory in Italy, not far from SS (route) 17, which, as we have seen before in Part I of this series, is a number associated with star gates. These "artificial" neutrinos traveled 60 nanoseconds faster than light with a calculated margin of error at just 10 nanoseconds, making the difference statistically significant. WOW! It may not seem like much, but it was enough to call a press conference and share what some skeptics believe could be flawed data. Back to the OPERA (Oscillation Project with Emulsion-tRacking Apparatus) project at the Gran Sasso ("great rock") National Laboratory (LNGS) in Italy (check out the list of their myth-named projects). Could the veiled "great rock" of San Grasso be a symbolic black rock of the alchemical tradition, a monolith forcing evolution? 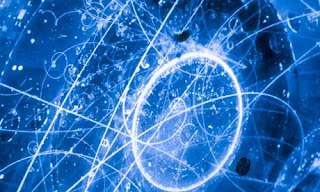 In a Scientific American article, theoretical physicist Antonino speculates that the "superluminal" neutrinos detected by OPERA could be slipping through extra dimensions in space, as predicted by theories such as string theory. Yes, these scientist actually are suggesting it could be the result of inter dimensional time travel. These linguistic clues and synchronicity are not going to quell rumors about CERN opening up star gates and wormholes. I can't wait to hear what William Henry has to say about all of this. Check out the logo for OPERA. It resembles the Colosseum, or Flavian Amphitheater, located in nearby Rome on what I would describe as an indigo background. As I mentioned in my last post, indigo is one of the colors associated with psychic realms, intuition, and our ability to manifest reality. At first the logo appears to be an obvious play on a tiered opera house, however it appears more likely that is is evoking one of the most famous structures of the ancient world: the Colosseum in Rome. 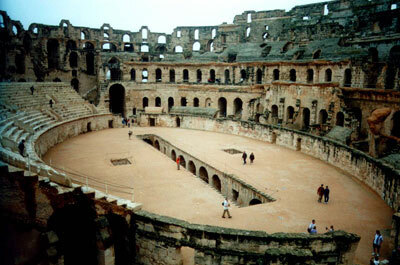 This amphitheater was the site of highly ritualized drama, including gladiatorial fights and naumachia, the re-enactment of naval battles, which engaged the emotions of the crowd to open up a new dimension or alternate to reality. OPERA's logo clearly designates a star-shaped portal marked with a red curtain held back by two mysterious flying beings and topped topped with a gold crown at the entry/exit of a seven story architectural structure. 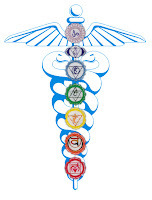 These seven levels may represent the seven lokas of Hinduism or the seven planes of existence of described in the Theosophical tradition: physical, astral, mental, buddhi, atman, monadic, divine. Could the logo of OPERA indicate that it is indeed trying to open a portal to the 7th levels of existence -- the Gnostic pleroma, the divine abode of God? Moreover, the O and A of OPERA are shifted below the PER, so that one might read it as O PER A. If O= omega and A=alpha, then might this suggest the reverse of alpha and omega instead reading: the omega by the way of the alpha -- the end by way of the beginning? The phrase "I am the alpha and omega" refers to Jesus in the Book of Revelation (verses 1:8, 21:6, and 22:13) indicating that he is eternal and one with God who was there at the beginning of time and will be there at the end of time. It is a phrase that triggers apocalyptic beliefs. Is it an unconscious indicator that CERN is reverse-engineering the theoretical Big Bang in its unsuccessful attempts to find the Higgs boson/God Particle? All this disguised doomsday imagery is starting to get on my nerves. In my last post of this ever-expanding series on Discerning the Demiurge in the Age of Technology, I examined the similarities between the two archetypes of knowledge: the Demiurge from the Gnostic Tradition and Rahu from the Vedic tradition. It became clear that whether consciously, or subconsciously, their mythic and blue-hued symbols are being used by companies involved with the evolution of technology. In mythology these two shadowy impulses are engaged in a battle with the light, both wishing to consume and appropriate the power of its divine Creator. In high technology these impulses are expressed by creating artificial worlds such as the internet, virtual reality, and artificial intelligence. In physics it is manifested by creating virtual (subatomic) particles that are artificially accelerated and smashed to locate the elusive God particle or to break through the light barrier into some other dimension. So what do "they" think is on the other side. Are they ripping wholes in the fabric of the universe to create a bridge to an alternate universe like the one Walter (and Peter) opened in the sci-fi worlds of Fringe? Let's just hope these artificial creations do not open gateways that actually allow the archetypes of Gnostic archons and Demiurge to be released from the cloudy realms of the astral plane only to enter the physical plane of light. I was put to mind of line from Rabindranath Tagore's poem "where the mind is without fear..."
Into ever-widening thought and action..."
Thank you and thank you, again.... dear Liz!! !